Why Boston’s Critical Mass is hurting the cycling cause. It’s a Friday evening in late July, and hundreds of whooping and hollering bicyclists are clogging the street at Commonwealth and Harvard avenues in Allston. This is one of the trickiest intersections in the city – some eight lanes of road pass through it, as well as two sets of Green Line tracks – and cyclists from a group called Boston Critical Mass are jamming it up by riding in circles, taunting the drivers. Car horns blast. 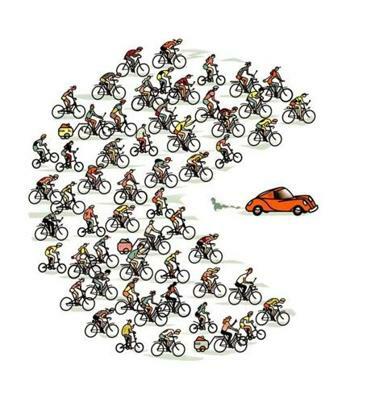 A solitary biker held up by the stunt yells, “You are why people hate cyclists!” A Honda Civic revs forward, forcing several cyclists to bail, and races off. Mangled bikes – and one person – lie on the asphalt. Once a month, members of the hundreds-strong Critical Mass get together to celebrate bike culture and protest car culture, as the group says on its website, by means of a “party on two wheels.” But that day the party ended abruptly – luckily the woman knocked to the ground had just bumps and bruises; the only serious casualties were bikes. I am obviously appalled at the actions of the driver, but my other reaction is bafflement: What does Critical Mass hope to prove by breaking laws and taunting motorists? As a longtime cyclist myself, I wanted to check out Critical Mass. I joined the group’s August ride, and what I found was a mixed bag of paradoxes. The joyful novelty of being able to ride unobstructed in Boston’s streets was not lost on me – I had fun. Many of my fellow riders were downright polite; a few even thanked the drivers they were holding up for their patience. While we did cork intersections to allow the group to illegally run red lights, we didn’t block them with the express aim of hassling drivers. Critical Mass has not been very good at getting its message out, yet I couldn’t help but think that we were making a political statement by how we were riding – and not a good one. At no point during the ride were drivers and pedestrians informed of Critical Mass’s mission to promote bike culture and establish a place for cyclists on the roads. From where I was sitting, the range of emotions among drivers went from confusion to anger, but never obvious support. I think we came across as a bunch of two-wheeled anarchists. No doubt bike conditions in Boston cry out for improvement. Bike lanes are nonexistent on many city streets, and few drivers know how to engage their two-wheeled counterparts. Bikers like Finley point out that drivers also bear responsibility for creating a safer environment. I agree. But things have been getting better. MassBike’s “Same Roads Same Rules” campaign seeks to foster civility and understanding between motorists and cyclists, for instance. The organization also tries to educate police throughout the state on laws relating to bicyclists. Yet the actions of Critical Mass and a few lawless others are hurting the cause of all Boston cyclists. That’s why Ditunno helped start an alternative group ride last month, dubbed “Courteous Mass – Boston,” that asks participants “to pledge to ride with courtesy and respect for all other road users, and to obey traffic laws” (a public health professional and former attorney, Ditunno made riders sign a pledge agreeing to as much). Unlike Critical Mass, Courteous Mass is showing the larger community that many Boston cyclists want their change with a side of civility. If Critical Mass is serious about its mission, it needs to tone down the party on two wheels. Aggression from cyclists, like aggression from drivers, needs to end before someone gets hurt. After all, we’re all riding on a two-way street. Steve Holt is a writer in East Boston. Send comments to magazine@globe.com.